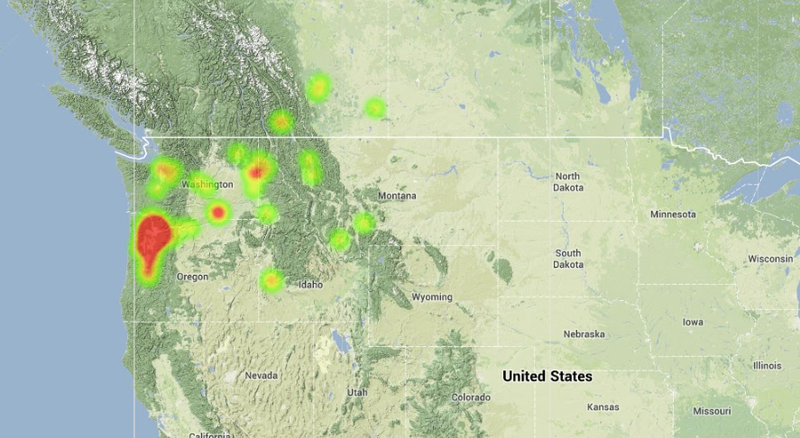 The American Meteor Society has received numerous (355 so far) reports of a major fireball event over the Pacific Northwest and southwestern Canada on October 30th just before 6:00am PDT (7:00 MDT). The fireball was seen primarily from the Portland, Oregon area but there are also many witnesses from Washington, British Columbia, Alberta, Idaho, and Montana. A preliminary trajectory plot shows the meteor entered over the southeastern Washington and ended near the Pacific coast west of the Seattle-Tacoma area. We have received very few reports from near the flight path, most likely due to cloud cover at the time of the event. The most notable feature of this object was the long path in the sky and duration of this event. Here is the current heat map for the event that shows where the witnesses reported from. Click the map below to review the event map and witness reports for this fireball. Kudos to your data gathering methods! I thought that the report was easy to navigate and was impressed by the use of the web mapping to show the locations and paths as reported by the eyewitnesses, very cool. Great use of GIS to estimate entry point, trajectory, and path. I’m a geographer/GIS analyst and am prone to geek out on such things. Nicely done, cheers! It took 8-10 seconds to cross my field of vision looking due North from 33205 SE Oxbow Dr Gresham at 5.58am at the almost exact part of the sky planes go over coming into land at Portland airport all the time. That same position of the sky takes planes 2 minutes to cross at whatever speed those planes are going. 200mph? I am no mathematician and have no idea of it’s altitude but was not small abviously and must have been going over 2,500 mph. It was same size as somewhere between an altoid mint and a penny at arms length. Yellowinsh white. It was silent and I did not notice a trail like most shooting stars. I was completely awestruck. I usually go somewhere dark with the kids for the annual showers. This was a real Halloween treat for me as long as no one got hurt. Thanks for your report! You need to add the fact that the fireball was some 200 miles north of you which increases the velocity even further. Meteors with this trajectory at this time of the day usually have an entry velocity in the vicinity of 20 miles per SECOND, which is quite a bit faster than 2500 mph. I saw it at about 6 AM in the southeastern part of Renton,WA. I saw it as it came into my view heading west, watched for at minimum 10 seconds before it dipped over what i assumed the ocean. No cloud cover just outside of West Richland, Wa. We had clear skies at around 6:00 am this morning . I went out to get the dogs and watched this Bright White comet just casually Cruz across the sky. There was no fire color. Just White , and you could see pices breaking off of it. And those had tails. I watched it until it went out of site approximately 10 seconds. It was going east to west, and the tail stretched from Red Mountain to Rattlesnake mountain. It was incredible! I was going into the lobby at work in Richland WA approximatel 5:55am and saw the trajectory as east to west as viewed toward the northern sky. The path was nearly parrallel to the horizon about 2 o’clock. It was white in color and I did not notice a smoke trail, sound or debris trailing. The size looked to be about the same size as the round end of a #2 pencil eraser. 3 other witnesses who were with me saw the event. Incredilbe – the sight was incredible especially considering the speed it had to have travelled! About 5 seconds of viewing with the intensity remaining nearly constant through the unobstructed line of sight! I witnessed the beginning of this incredible meteor from Spokane. It was a crystal clear sky with absolutely unlimited visibility. I looked at the moon, then up to Orion for a few seconds, then back to the moon and thought, hey, that bright planet doesn’t belong there (bright dot a few degrees below and “north” of the moon, approximately 30-35 degrees above the horizon) and then the dot became bigger and the tail started stretching out. Being originally from the south, land of thunderstorms and used to counting seconds from the flash of lightning until the sound, I immediately started counting off seconds. The meteor came high overhead, about 80 degrees elevation, leaving a long trail of about 30-degrees arc when overhead, and was pure white, against the black sky the white was the more brilliant than I think I’ve ever seen. The meteor continued to the West Northwest and I was able to follow it until about five degrees above the horizon when it disappeared behind some obstructions, but it was still very large and visible at that distance, though dimming from viewing it through hundreds of miles of horizontal atmosphere. I watched it for 19 amazing seconds! Thank you for your amazing website and reporting tool. I seen this fireball this morning around 6 am as I drove to work in Bothell, Washington. It moved pretty slow, and was a good size, and had a long trail. First time I’ve seen that! Thought I was just tired, but this website proves that I am not crazy! I saw this as I was leaving Starbucks on 164th & Mill Plain in Vancouver. I was pulling out of the parking lot and looked to the left (north) to check for traffic before pulling out. It caught my eye right away and I thought to myself “what the hell is that!” I watched it for a few seconds and then it disappeared from my field of vision behind the Target building. It reminded me of pictures I’ve seen of Halley’s Comet. Had a big tail behind it, but not real long. Seemed to come to a point pretty quickly behind it. I’m not sure on the speed, although it did appear to be going past me about the same speed or perhaps a little faster than the F-15 Guard jets that we see flying over ever once in a while. It was awesome. Once in a lifetime sight probably. Reports from Calgary say this was an iridium flare …. Reflection off a satellite … Can somebody tell me if it was a meteor or not! Thanks! I believe the preliminary reports prompted it to be called a flare. When more reports became known from further away, it was clearly a fireball. I was going down the 22x south in alberta going hunting in pincher creek and i was just passing chain lakes about 645 am to 7am and it was pitch black out when out of no where this bright fire ball which seemed very low lit up. It had a tail and it moved very fast from the direction of east to west… it seemed lower to the ground straight ahead than up in the sky. Traveling over Blewett Pass this AM around 5:55 and witnessed a bright shape cross my field of vision, looked like it was larger then the moon. great way to start a Wednesday. I saw what I first thought was a falling star at 5;58 am in Lebanon Oregon it was huge and fast.it flew over Pioneer school where I work it was impressive. I was driving on I-5 North near Albany, OR when I spotted a bright object out of the right side of my windshield around 6:00 a.m. At first I disregarded, thinking it was a low flying airplane, but on second look I realized it was not an airplane, but possibly a shooting star. I continued to watch it as it headed west and realized it was a meteor…impressive. Nice way to start my morning. I was traveling east on I-84 just passed Multnomah Falls at 5:58 am. It looked like a shooting star at first but never “burned out”. It stayed very bright, moving east to west, never changing elevation, and moving very fast. When I got to work several others also said they saw it. so cool !!!! went to work but no one but me saw .i live south of independence or. I have never heard the term “fireball” What’s the difference between a fireball and a meteor? Fireball is a very bright meteor. There is some disagreement on exact definition, but generally it has to be brighter than Venus (the brightest planet). I was traveling on NE 72nd Avenue northbound approximately 1/4 mile north of 159th Street when it came into view. Lasted about 5 or 6 seconds. At one point I thought it burned out, but then flared up again before it left my view. Great way to start the morning! I live in Naselle, Washington (SW Wshington) I was up getting my son ready for school and all the lights in the house were still out and it lit up my house like somebody was shining a spotlight in real quick!!!! A friend of mine reccomended I look on this site and I’m glad to see everyone else reporting on it also!!!! Thank You! Could there have been more than one? I saw what I guessed to be a meteor streaking across the sky as I was on my way on I-5 from Blaine to Bellingham, WA around 10:20 a.m., on the morning of Tuesday 29th. It appeared to be going “down” near Mt. Baker area with a west-east trajectory, and then I lost it in the clouds just above the skyline of Mt. Baker. I am kicking myself as I had my camera with me and didn’t take a photo of it as I thought maybe my eyes were deceiving me and it wasn’t a meteor after all. That will teach me to take pictures first and ask questions later. Anyone else see what I saw? I was at my university’s crew practice on American Lake (Lakewood, WA) and I definitely saw it fly East to West looking North. The current estimate shows it possibly being South of the lake, though. Either way, was a great experience and thank you for compiling this. Very nice video of it captured by the NMSU network from Bellevue WA. Looks like it passed a lot closer to Seattle than Portand and Spokane, but very few reports from Seattle! I have not done a calibration on that camera, but it looks oriented roughly correct. The camera picks it up just South of Spokane and loses it behind clouds west of Bainbridge Island. The entry angle had to be less than 10 degrees from the camera measurement. 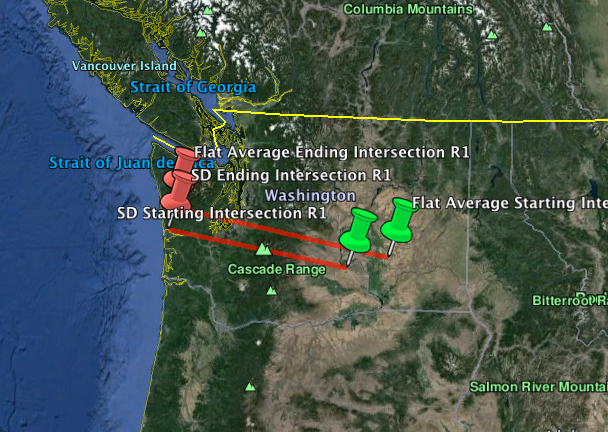 From eyewitness reports it appears it was about 5 degs maximum and traversed 800km (border of MT east of Spokane to well into the ocean west of the Olympic Mts). This meteor could have been visible for about 40 seconds (at an average speed of 20km/sec) although nobody could have seen the entire path (from the surface of the earth). This has to be one of the longest paths ever recorded. The Cranbrook camera catured it for 20 seconds at a constant angle of about 5 degs above the horizon. It picked it up over northern Powell County, MT and lost it just on top of the Bellevue camera. It tracked it for over 670 kms at an average speed of 33.5 km/sec. As I stated in my summary, it appears that the skies were overcast in the Seattle/Tacoma area at the time of this fireball. Most unfortunate! I was out on my morning run when I saw the streak out of the corner of my eye and turned to see it to the north and traveling from east to west. I live in the Salmon Creek area of Vancouver and was running past the elementary and middle school at the time. On the 30th about 6:00 AM while waiting for the bus at Ash Way Park and Ride in Lynnwood, WA. I noticed the moon and was just looking at it when a large light appeared, it got brighter and then it seamed to go right overhead. Was very fast and only lasted a few seconds. Made no noise at all. Very big. Amazing. we were walking approx. at 6 am in Federal Way, WA. It was travelling from east to west, I think. You could see it go through the clouds. It seemed as if it were a long shooting star or a comet with a tail. We weren’t sure what it was. But it a beautiful sight to see. Wed. 10/30/13. appx 5:59 AM, Walla Walla AW, while unlocking the gate at work, I happened to be looking up at the sky, saw a large white light traveling East to West, almost overhead, and low in the sky, lasted several seconds, much longer than the shooting stars I have seen in the past. Beautiful, what a way to start my day! I observed it around 6:00 while walking the dogs in Northeast Seattle. It appeared over a hill in the east and looked like a firework had been shot, it was bright white with a long sparkling tail. But instead of going up it went over us until it disappeared westward over a ridge. It moved steadily and was quite spectacular while it lasted. Aqui no Brasil, na cidade de Estância, Sergipe, presenciamos dois eventos parecidos em nosso céu. Dias 1 e 2 de Novembro 2013, fire ball cruzaram o céu de uma forma fora do “tradicional”. O que nos chamou atenção, foi devido o arrasto ser muito grande, podendo ser visto numa grande extensão. I saw this beauty just as I stepped out of my apartment in Salem, OR to head to work. It was about 0550. The detail was pretty spectacular. I saw some responses that there was no tail, but I had a very clear view since there wasn’t very much cloud cover in my area. There was a very long tail, and I was able to see some fragmentation as the main part of the meteor passed over the horizon. It looked like a perpetually moving, lightly-packed, snowball, slowly breaking apart in little bits as it moved west. There was no sound, and it was a nice bright white. I was lucky enough to have a show for over 25 seconds before my view was obstructed by trees. I wish I had turned on my camera on my phone, but I was too awestruck by my first meteor sighting of this magnitude. I saw at 6:45 pm, I was at U Haul on Andresen & Burton. My friend and I had just finished unloading a U-Haul truck. Her and I were facing north while another friend was standing in front of us (facing south) asking the time. It looked as though it was right in front of us. It was big, very bright (like a kaleidoscope) with a scalloped edge on the right. It was definitely a WOW moment…glad I got to see it.